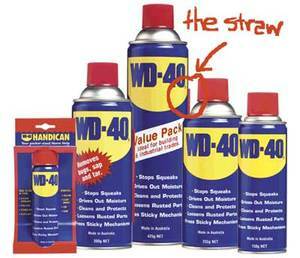 Marketing Daily reports that WD-40 has finally created an attached "red straw," which formerly was taped to the side of the can. The company has been making the product for 55 years, and losing the straw has been customers' most consistent complaint. The straw is used to direct the lubricant into hard-to-reach places. My question is this: why on earth did it take them so long??? Where the heck is Susan these days? All the clients who weren't in a rush in February are in a rush now [Of course I don't mean you, I know this is a genuine crisis. I mean those other clients.] The projects that had no clear timetable, they have one now. That delivery date that was flexible before? Now it's not. I have a personal life. Every now and again I get reminded of that. Sorry, but that's just the way it is. Sometimes the blog just has to wait. When the sun is shining, we all want to go play. If you live somewhere the sun always shines, you may not understand this. But here in the great white north, this is the time of year we all crawl out of our cave, grab our ball glove, and put a smile on. It's hard to focus on reports and proposals when the crocuses start to come up. Things will get back to normal soon. But I bet you are having the same problems, and you're probably as behind on your blog reading as I am! I heard Terry O'Reilly speak a few weeks ago, and came across this in my notes. "Emotions should be felt, never stated." How very true this is. Consider a vodka ad that evokes the emotion of feeling special, versus one that says, this vodka can make you feel special. Makes total sense. But it's easy to lose that clarity when you're in the middle of message development. "People don't want to be targeted, they want to be understood"
"The only way to explode a paradigm is to be armed with a detonator called 'the insight'"
Avid reader Bruce W. told us about his recent experience with Air Canada on a five hour flight. When the entertainment system didn't work, apologies were made and vouchers were handed out. Vouchers were reported to be for "future travel" or Aeroplan points. When BW went to collect via the internet, there was a choice of "Goodwill Options", either points or a travel voucher. But how could he choose when no value was provided for each? 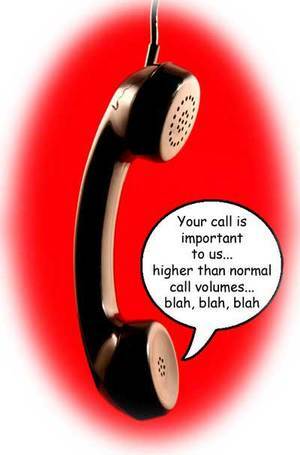 A quick call to the customer service centre revealed that the points option is usually a better deal. But you couldn't tell from the form. Still, it's a big improvement over the past. It's just such a big hill for them to climb. Coach, the luxury handbag maker, announced in March that they are opening 40 more stores and are upgrading stores to the larger flagship format (as large as 5000 sq.ft.). They see more of their sales coming from the high end stores, and also have research that suggests women are still splurging on bags even if they cut back elsewhere. Tiffany, on the other hand, is opening smaller stores that focus on the lower end of the product line. The middle is often the danger zone, where you are too expensive for the mass-market, and too ubiquitous for the luxury market. Plus the middle is where all the competitors are. Doesn't this just make you wonder where Starbucks is going to go? There are so many interesting things going on in the world, are there not? I want to share more of these with you as I hear about them, but they're not all worthy of a full post. So starting this week, I'm going to periodically bundle up a few of these in a Friday "This just in." These summaries will not have our regular level of analysis. For those of you using an e-mail subscriber, I'll keep the title the same so you can easier manage your in-box. Stock art libraries put high-quality photos and illustrations in more hands, and gave visual artists new outlets. Now the same thing is happening to sound. Let's say I want to add some sound to my PowerPoint presentations. Or to my website. I can now do that *legally* and relatively cheaply, with someone else managing the rights. You don't have to wait for a composer to write something in your honor, you can commission a Requiem or Laudatio to mark the major milestones in your life (or death, as the case may be). Vienna-based company Requiem For You will commission a composition to commemorate your life and achievements, arrange for an audio recording in your choice of media, and arrange a performance. You have to apply. You have to qualify. And a one-year membership costs 1700 £. The latest to add internal social networks is Scotiabank. IBM and other major tech/knowlege organizations have been working on internal social networks to share knowledge for a while now. Seeing a bank join in suggests that there will be much more of this happening in future. Will it prove to be a competitive advantage? Stay tuned. I saw a good story illustrating the power of an unusual situation to create either good news or bad news. A fellow by the name of Ron Borgna in Binghamton N.Y. was frustrated by the size of increases in the water rate. So he made up his cheque for $2,509.66 on three squares of toilet paper and presented it at the water office. The office refused to accept it. Mr. Borgna has been in dispute with the municipality since 2006, and was trying to settle the whole outstanding amount, including fees and late penalties. Clearly, the man was trying to save face. But the municipality would not let him. This is sometimes called a moral victory. Now there is no way that you could process a cheque like that in the normal manner. It would probably be called a "special item," and would be manually handled by every bank that touched it. (With a bunch of manual handling charges to match.) But, if it had all the correct information on it, I think it would be legal. The water authority had two options, and it chose the worst one. If they had accepted the payment, they would have demonstrated a sense of humor. By continuing to fight with the man, think of the hours of management time being wasted. Much more than the value of this unpaid bill, I would wager. In the photo above, found here, you can see two senior people from the municipality on the left. Instead of creating all this bad press, good press could have been created. 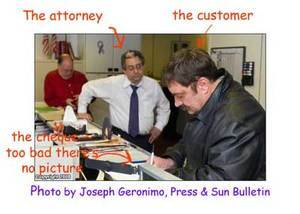 The banks involved could have been asked to co-operate, and the city could have said, in effect, "hey, we know people hate paying bills, and we don't want to encourage this, but we have a sense of humor and we are glad to see Mr. Borgna meeting his legal obligations." This way, they look like a bunch of heavy-handed jerks. Plus, they're not yet done with this thing! The American spelling, toilet paper check, generated over 500,000 entries. Associated Press covered it, so it was picked up over a wide area by networks like MSNBC and papers like the Denver Post. Even the Canadian/British spelling toilet paper cheque yielded results: CNews, Citynews are two examples of Canadian news outlets that picked the story up.